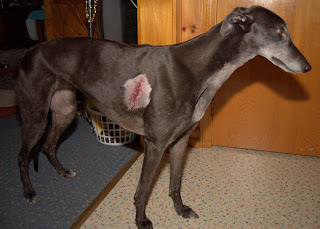 A 2 inch blood red gash with a flap of skin hanging on the side of a black greyhound would seemingly be an easy thing to spot. After an afternoon of whining and general fussy pantsedness, I sent Bettina and Blue out to the backyard for an unscheduled potty break. I went back to my office to work and heard them galumphing about the backyard like a herd of stampeding water buffalos. Then I heard Bettina let out a bark/growl followed by silence. Parents of human children know that as soon as everything gets quiet, you must run, not walk, to see what everyone is up to. Which I did. Skin tears in greyhounds are not unusual at all. They have such thin skin with no fat. It doesn’t take much. It’s almost a rite of passage as a greyhound owner to wait atnthe vet’s while your hound is stitched up during an emergency visit. So you might imagine that this was not a major surprise for me. Having literally just finished the Red Cross’ book on canine first aid, you might also think I was pretty well prepared for how to handle this situation. I had watched the first aid DVD. I had beefed up my doggy first aid kit with all sorts of bandages, gauzes, cold packs and vet wrap. If ever there was someone who was ready for this crisis, it was me. So the very first thing I did when I saw the skin tear was to panic. By-passing a whole bag full of bandages, tape and wraps, I ran to my own medicine cabinet and grabbed the most inappropriate thing I could see, an Ace bandage. I tried wrapping it around her middle section and adhering it in place using those little metal grabby thingies that come with the Ace bandage. 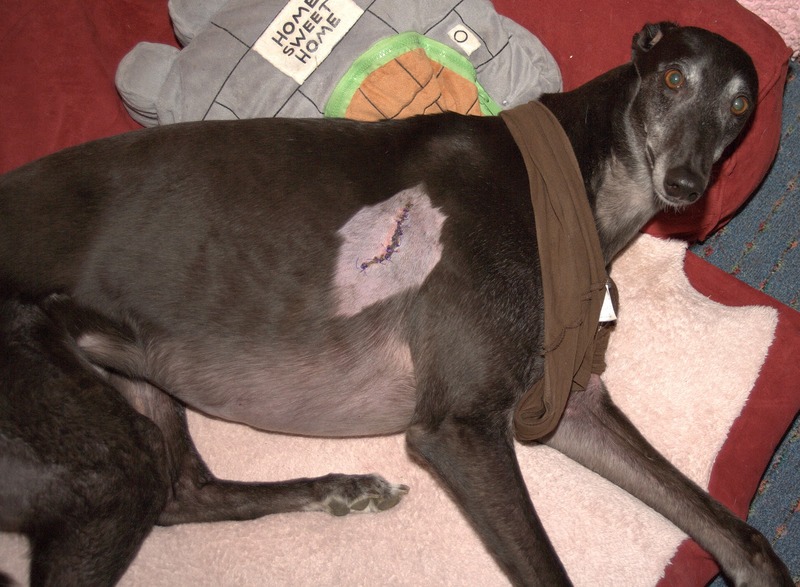 Since greyhounds have such deep chests, the Ace bandage made it around one and a half times. Plus it was only 1 inch wide and thus, did not cover the entire tear. Still, in my state of mind, this was a great improvised solution until I could get her to the vet. I got Blue into his crate, closing only one of the latches, grabbed my wallet and Bettina and I was out the door. I forgot to lock the door so I ran back to the house to double check that and when I did, it reminded me that I had neither my house key, nor my car key with me. I grabbed the keys and ran Bettina to the car. 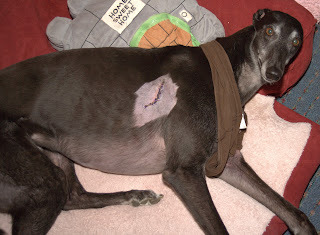 At that point, my brilliant Ace bandage triage had slid down, going from a chest wrap to a stylish, if bloody, belt. No time for repair though, THIS WAS AN EMERGENCY PEOPLE! ﻿ ﻿ I managed to deliver Bettina to the vet in one piece. Her skin had gone from a 2 inch tear to a 3 inch tear in the course of our journey. 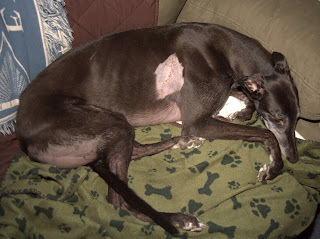 They took her in and put about 12 sutures in her side. They handed me back a slightly worse for wear greyhound completely whacked out on the last of her anesthesia and on some apparently good pain meds. If she hadn’t been on leash, she would have floated away. She peed all over herself and the back of the car on the way home. Then she peed all over the bed she was laying on in the living room. Got to love anesthesia. As soon as we got home, I recalled all the first aid prep I had just completed and the robust collection of medical supplies in my basement. Actually, I tripped over them while I was downstairs washing the bedding from the car and the living room.